Rinse and drain canned ingredients. Combine with red onion, lime juice, and cumin. Stir, refrigerate and serve. Can make 1-2 days ahead of time. Add lime juice before serving. After two busy days in the kitchen, I was finally ready for some food and a cold glass of Sangria! I woke up early this morning over an hour before my alarm. The fact that I fell asleep at 9:30 last night may be to blame. Surprisingly, I was not as sore as I thought I’d be. 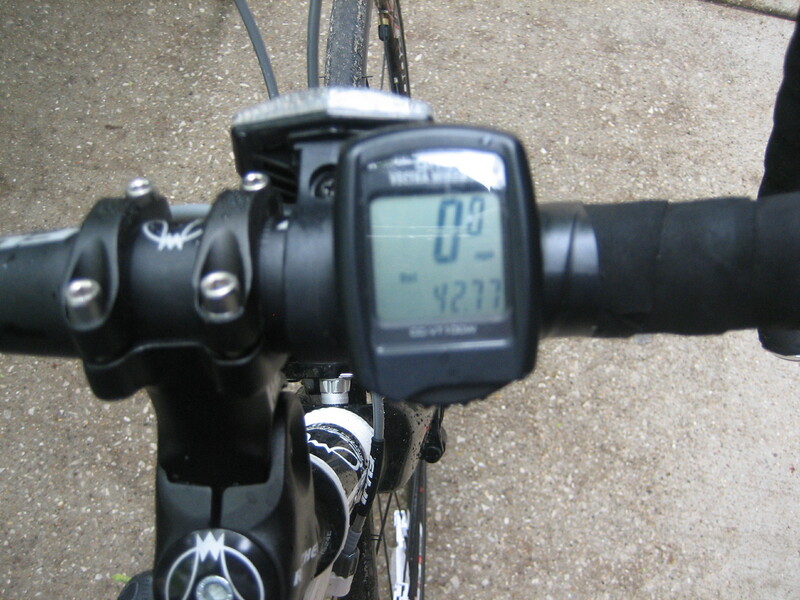 Considering yesterday was my longest ride of the year (and I took a tumble), I wasn’t sure how I would feel today. My bottom hurts a bit (as can be expected after a long bike ride) but the rest of my body feels great…good enough to start my day with a Hot Yoga class. Luckily, there were three classes this morning and I planned to go to the 8:00 class with a new instructor named Joy. 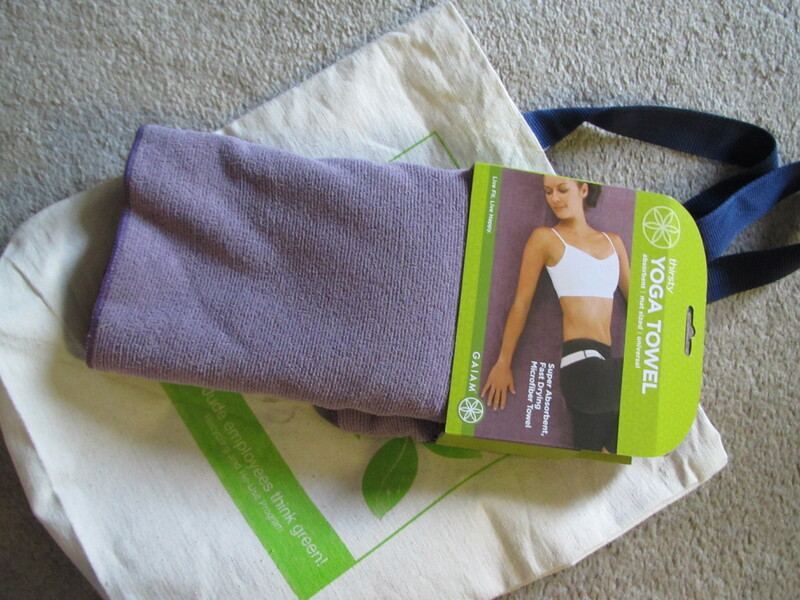 I made some tea and an open-faced egg sandwich on WF Seeduction bread and headed off to the yoga studio excited to put my new yoga towel to good use! There was no traffic and the typically full studio was surprisingly empty when I arrived. I even got one of the coveted front row spots near the mirror. People filled in, but the class was not as crowded as usual. I’m guessing most people used their day off to sleep in and weren’t up and at ’em before the sun like me. Are you familiar with this poem? What verse resonates with you? After a quick run to WF, I was home and ready to do some cleaning and cooking for this afternoon’s BBQ. 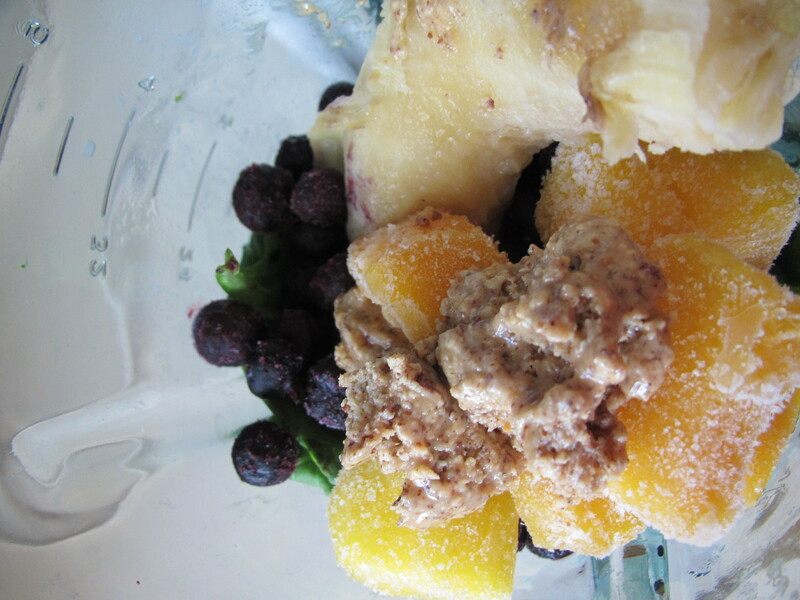 I made a fruity version of the Green Monster using spinach, almond milk, 1 over-ripe banana, almond butter, and frozen blueberries and mangos. It was refreshing and perfect to keep my hands out of the snacks I was preparing for this afternoon. 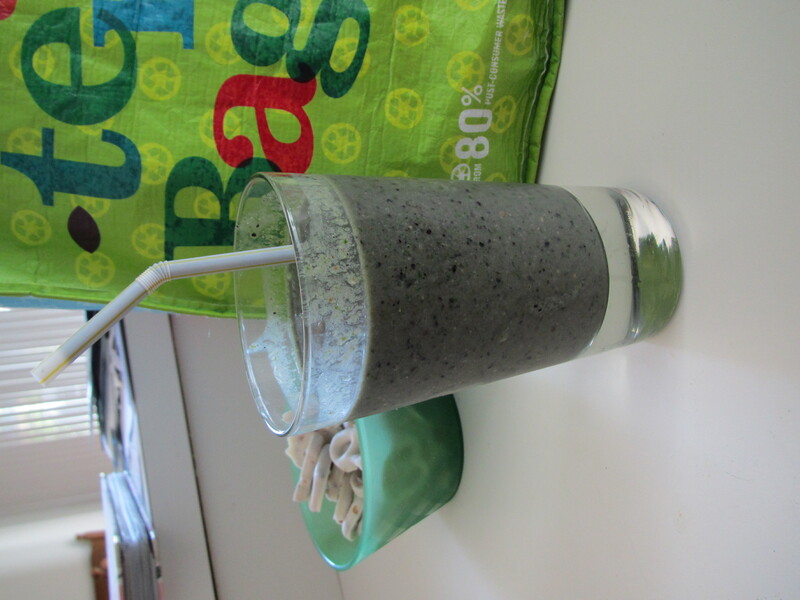 What a funky colored smoothie?! 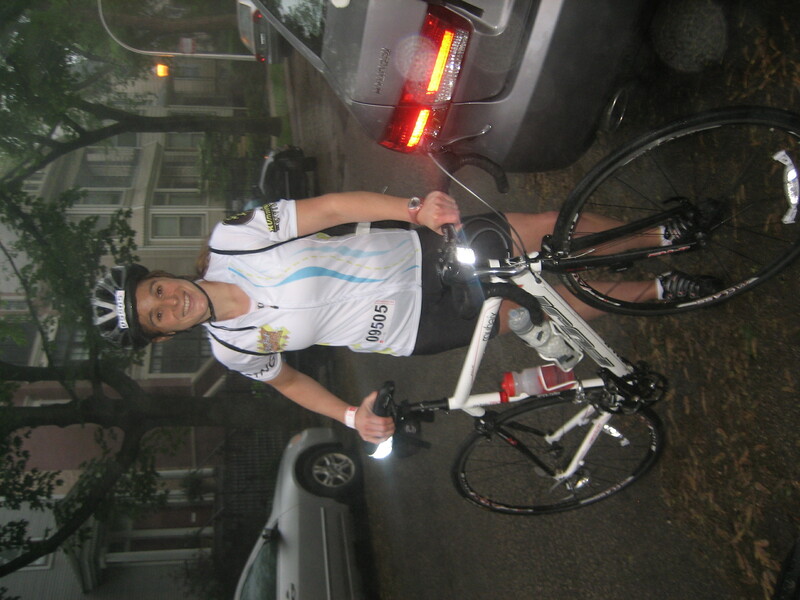 I have one word to describe this year’s Bike the Drive…Brrrrrrr! That’s a long word and to be honest, I’m not even sure if it would count in a game of scrabble, but when you combine cold/ wet weather with a bike ride=Brrrrrrr!!! I spent last night with my parents enjoying delicious salmon and veggies (and of course some red wine). 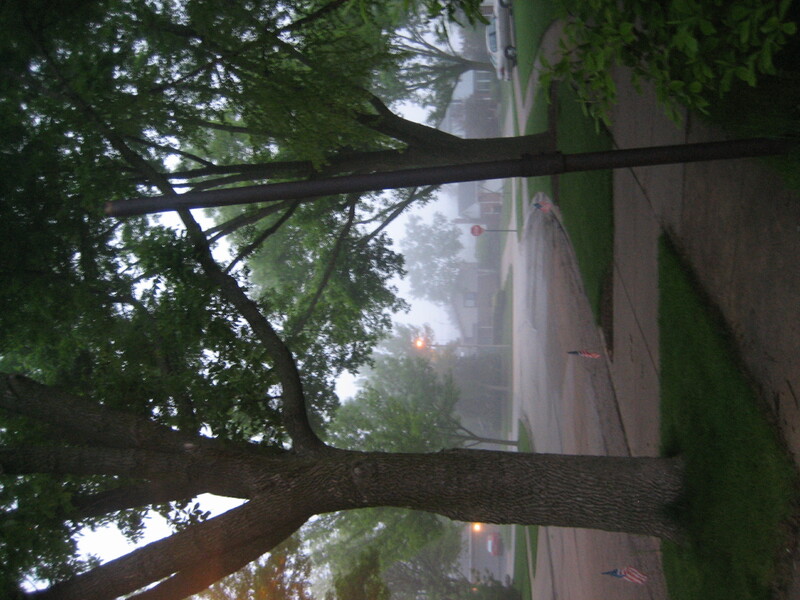 My mom and I woke up at 4:45 today to a cool and foggy morning. No rain, so we packed up our clothes, made some tea and grabbed Almond Butter and Banana sandwiches for breakfast on the go. 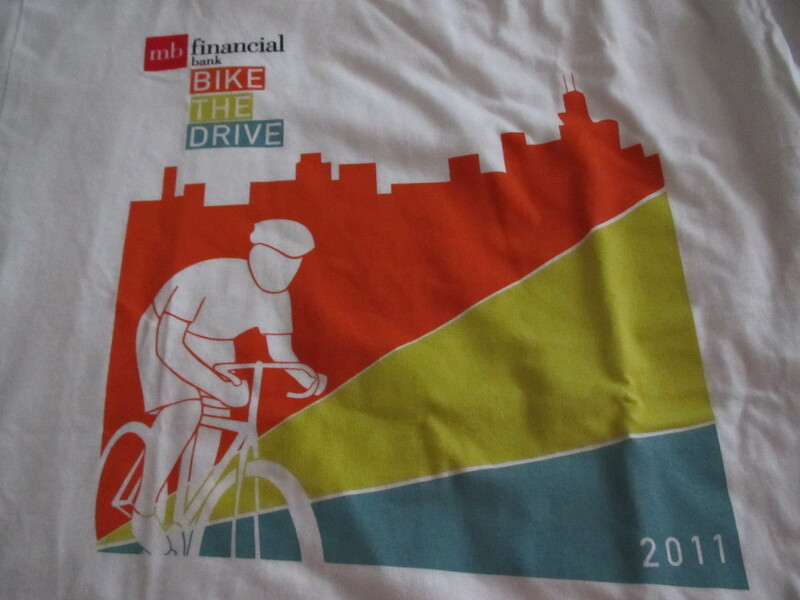 For the second year in a row, we loaded the bikes onto the car and headed into the city for Chicago’s Bike the Drive. 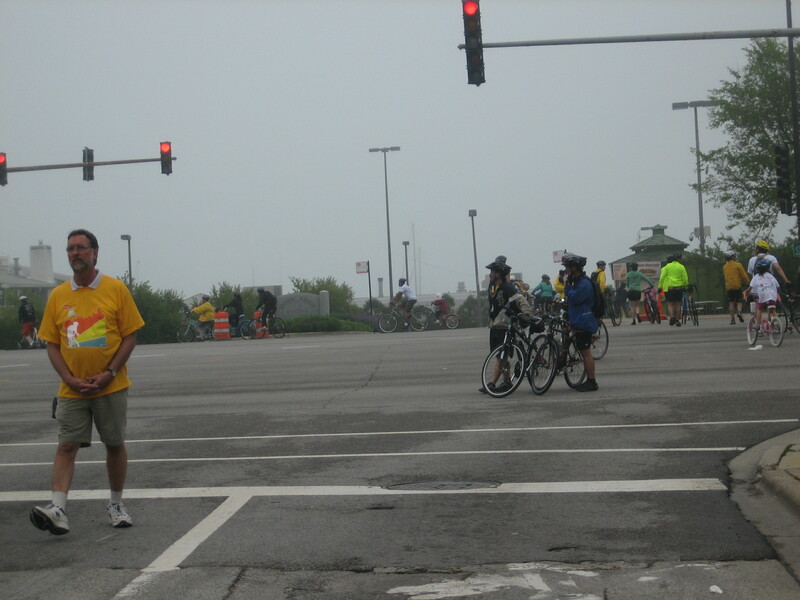 We randevued in Lakeview, picking up my brother and rode off in the mist to Lake Shore Drive. 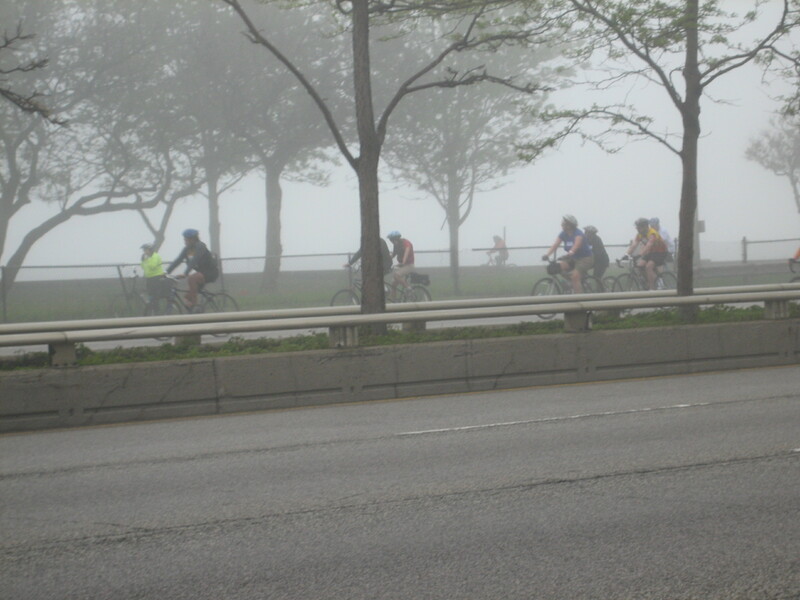 With a little chill, I was optimistic that the fog would burn off into the 73 degree promised by weather.com. 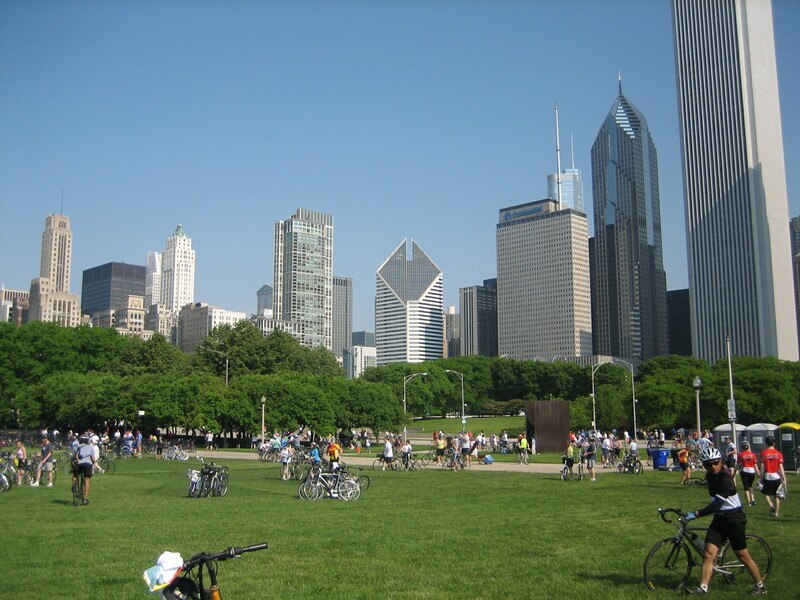 We rode south towards Grant Park and ~4 miles in, I pulled off to the side with my brother, forgetting about my clipless pedals and took my first tumble straight onto the pavement. Ouch!!! I bruised up my knee and hip and rode off with a gash on my knee. 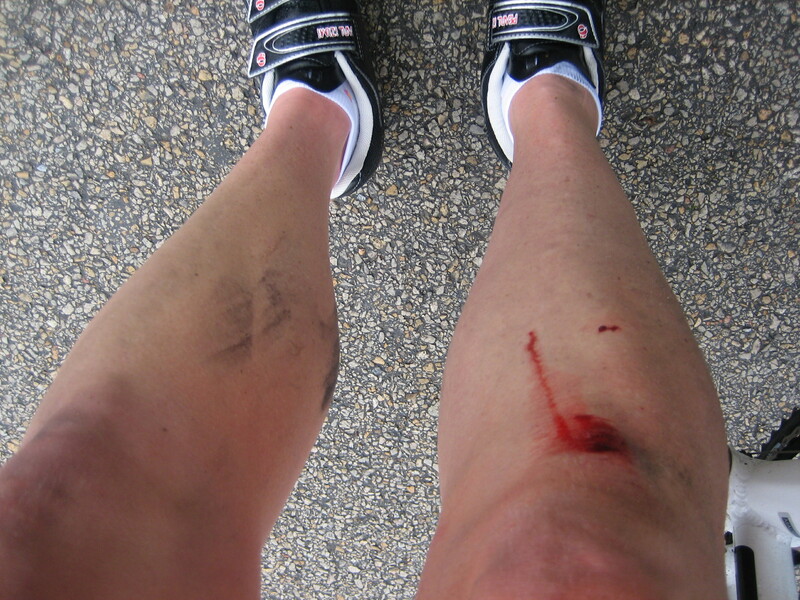 The wet weather didn’t help things as blood dripped down my leg. 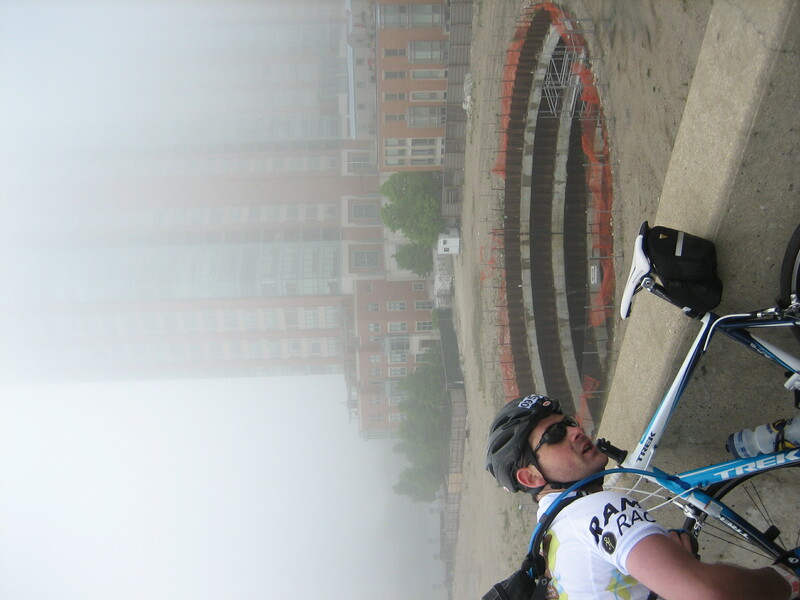 Luckily, I had some wipes to clean off my knee and continued to ride south to the Museum of Science and Industry campus. 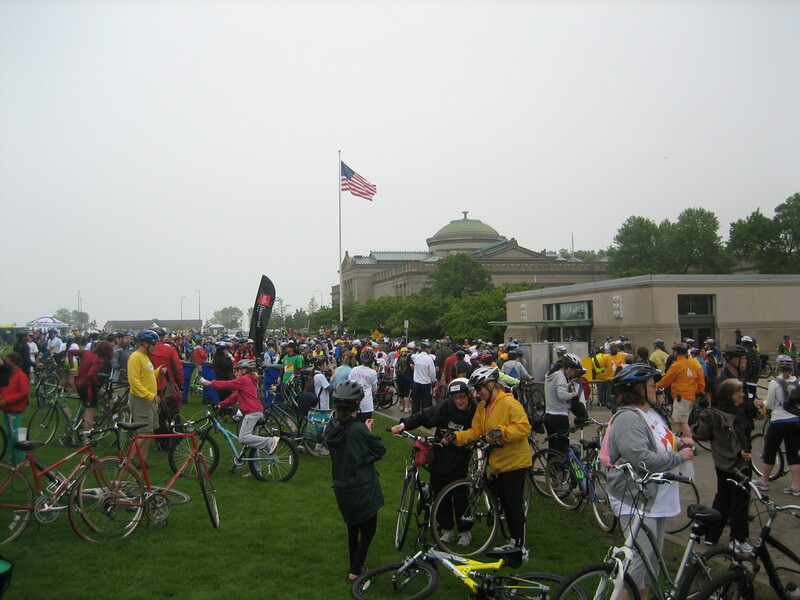 Fortunately, I have some amazing pictures from Bike the Drive 2010, so I figured (since I wasn’t blogging at that time) I could share them with you today. 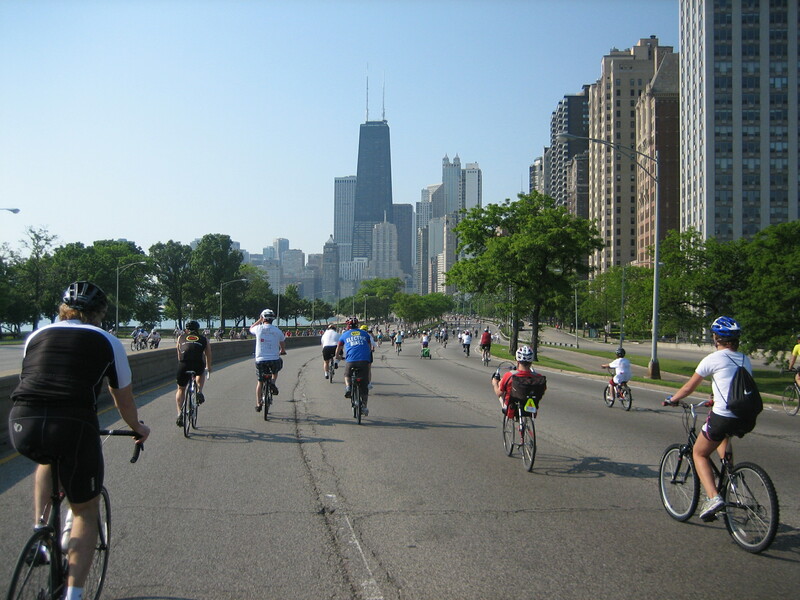 As time went on, the bikers thinned out and we finished in Grant Park with everyone else. 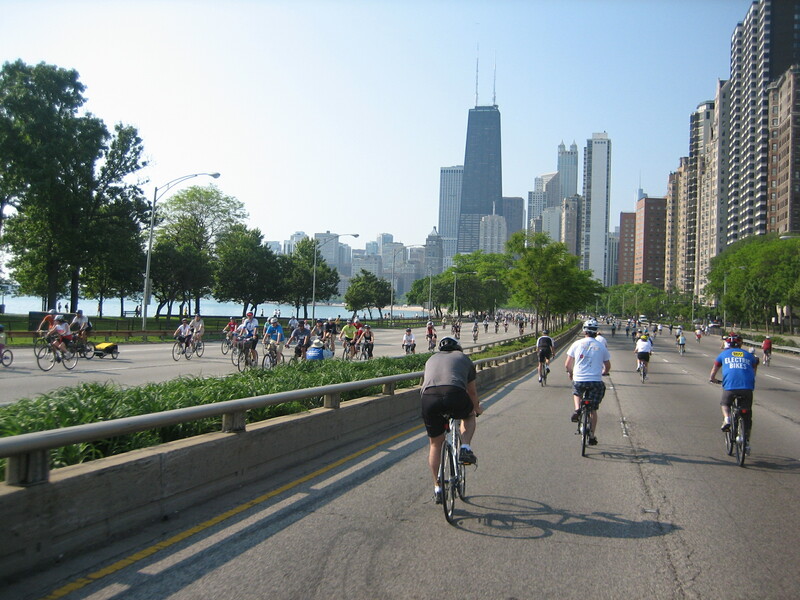 Since Lake Shore was opening back up to cars, we rode the Lake Shore path right along the water back to Lakeview. 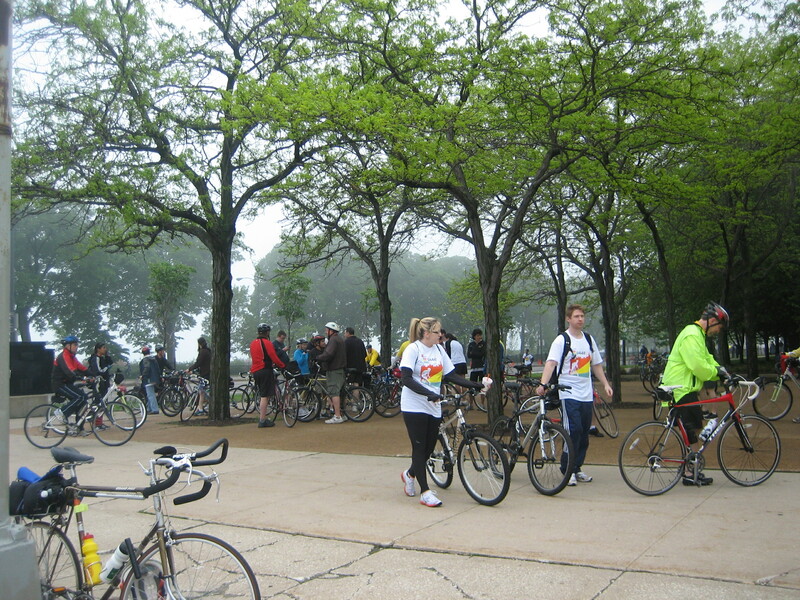 The path was packed with bikers and runners and it was so foggy and chilly that we could barely see the lake. I think I even lost feeling in my fingers for some of the ride home. 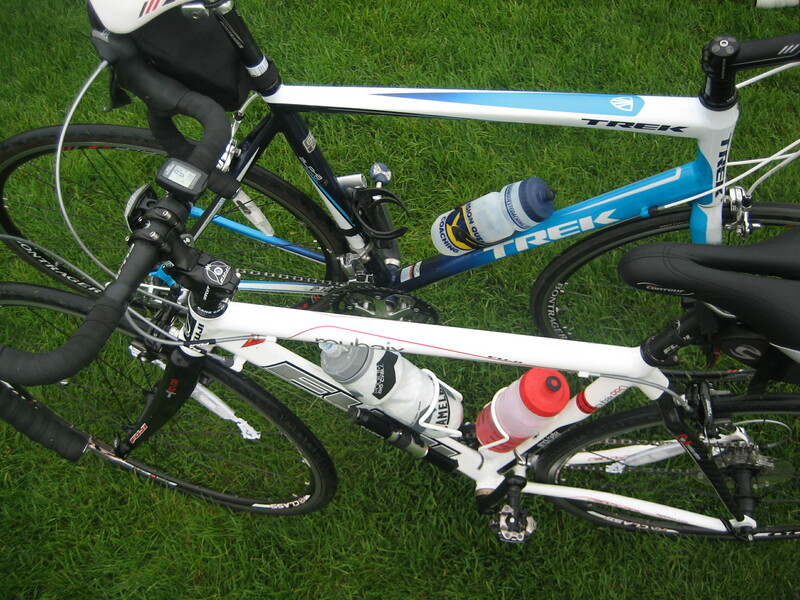 At this point, I considered renaming today’s ride ‘Bike the Artic’. 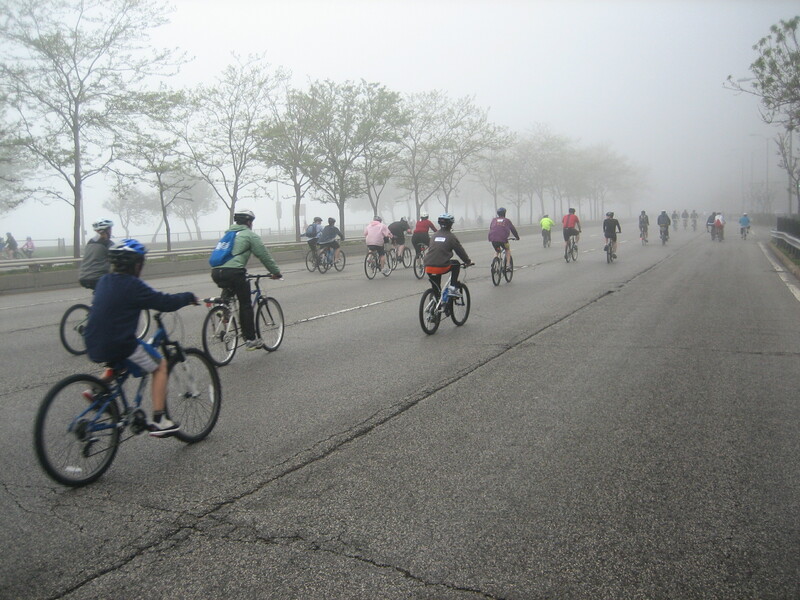 In the end, we rode 42 miles and although it was a freezing finish, it was a fun and active morning. After a warm shower, I went to Starbucks to pick up victory lattes. The rain started pouring and continued for most of the afternoon (it’s 6PM and I am seeing sunshine for the first time all day). The BOY and my dad came into the city, and we all went to a wonderful breakfast place in my brother’s neighborhood called Bakin’ and Eggs. Sadly, I forgot my camera, but we enjoyed a bacon flight, egg frittatas, pancakes, and breakfast sandwiches. Everything looked and tasted amazing and was well worth the long wait. 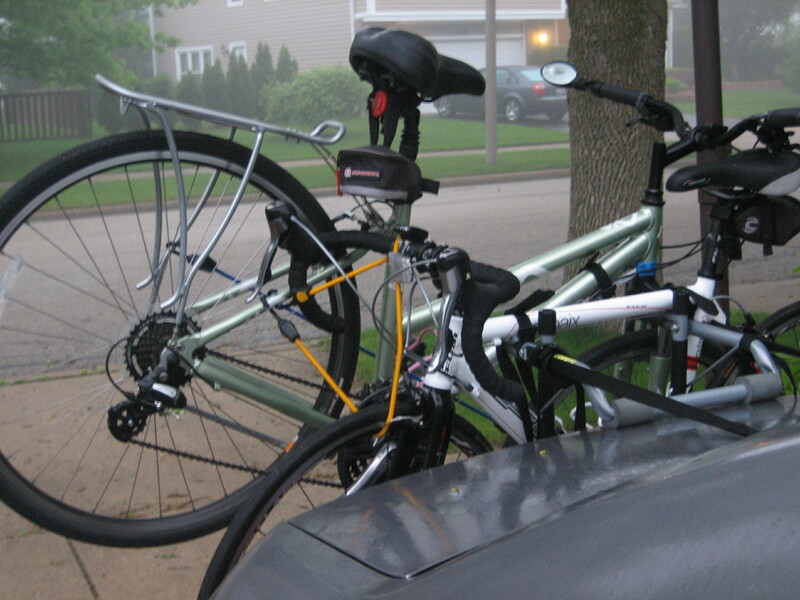 After a wet walk and ride back to suburbia, it was off to the grocery store to pick up the fixin’s for tomorrow’s Memorial Day BBQ the BOY and I are hosting. Can you believe they’re calling for 90 degree weather…that’s almost 30 degrees warmer than today. 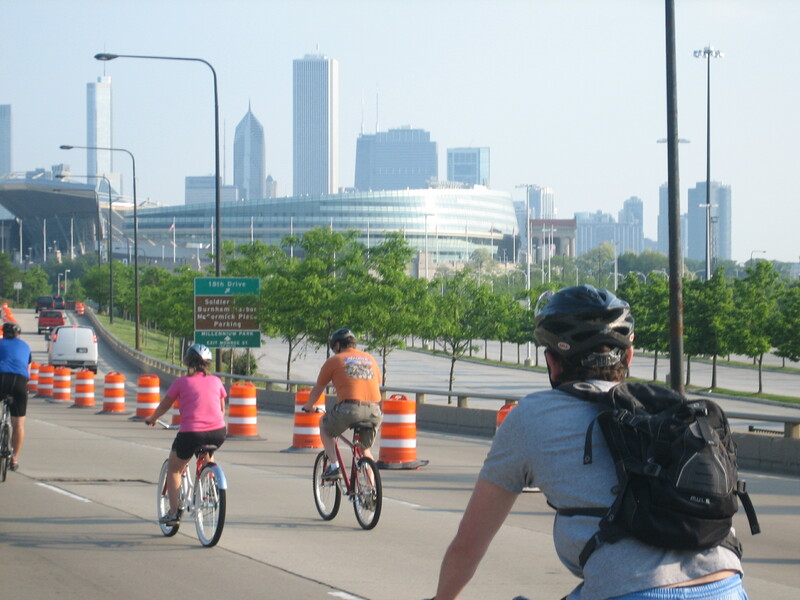 Gotta LOVE Chicago!!! It’s cold and it’s rainy. I’m drinking hot tea instead of iced tea and I’d love a bowl of soup! My calendar tells me it’s May, but I’m not sure I believe it. I went to Run Club this morning in long pants and long sleeves. I even packed my hat and gloves although I didn’t end up needing them. This morning was an endurance run (6 miles in about 52 minutes). It’s always motivating to go running with other people! The only sign of spring I’ve seen all day is the Organic Market that popped up at my local outdoor mall. Last summer, there was a small market at the mall a few miles down the road. I was there almost every week and they knew me by name. I was sad to see that they weren’t returning this year, but thrilled when I saw that the Green Grocer was opening a secondary location way out in suburbia! Thanks Guys! I met my mom for an impromptu shopping spree and then we headed over to the food stand. Since it’s the beginning of the season, there wasn’t a huge selection, but the produce was BEAUTIFUL! Unfortunately, I did not have my camera with me (and ya’ll know I don’t have a smart phone yet). We started chatting with the owners and their staff who were all so kind and fun. 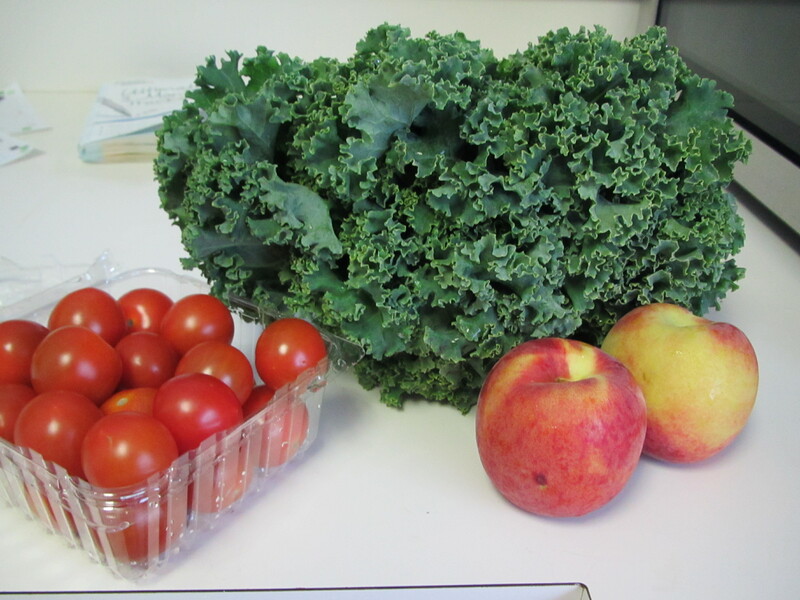 Between the two of us, my mom and I bought tomatoes, mushrooms, peaches and kale. 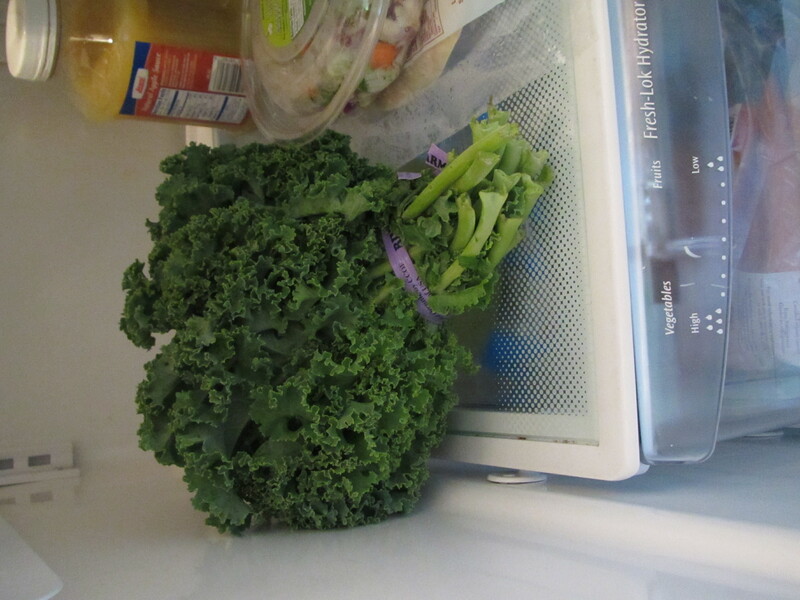 The kale looked so good, I had to grab it. My mom scrunched up her nose..even when I suggested Kale Chips. The owner promised she had a recipe that would change my mom’s mind using olive oil, garlic, and chili powder. I quickly gave her my email address and promised not to stalk her if she sent me the recipe. 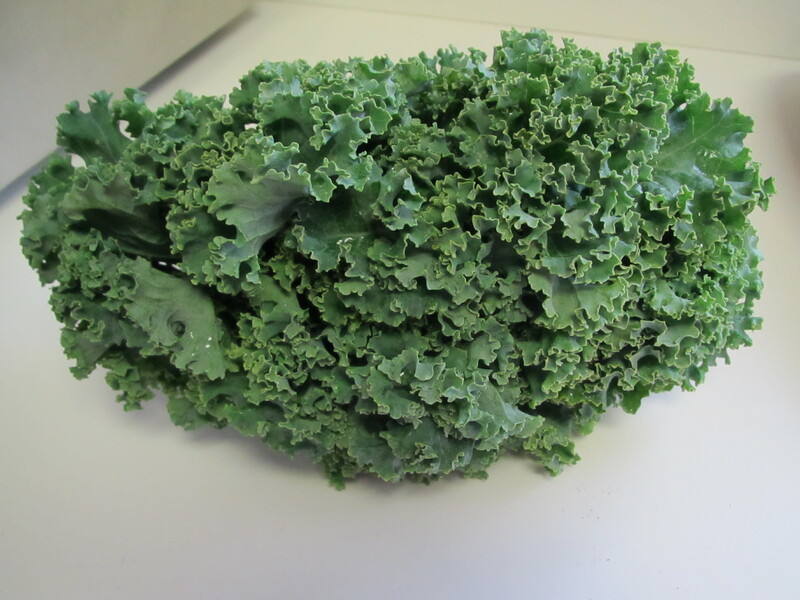 I am super excited to make Kale Chips this week! Running into the house, I dropped my bags and headed to the bathroom. When I came out, I found Emmy nibbling on my kale. She jumped when she heard me (because she knew she was in trouble). Obviously, she has a different opinion of the kale than my mom. I hid my gorgeous kale in the fridge (where the cat can’t get it) and used my fresh tomatoes on a salad. Man, I LOVE farmer’s market season. Even if the sun’s not shining yet! If you are like me, you don’t have a lot of time to make a healthy dinner during the week. And, I get a little tired of veggie burgers (although I do love those Dr. Praegers California Burgers…yum!). 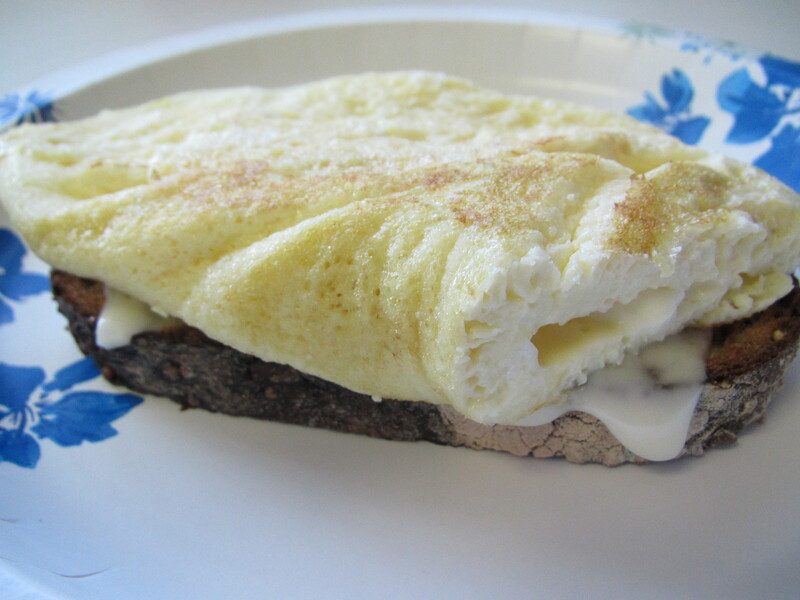 I found this simple recipe in a fitness magazine. It was listed in a meal plan and perfect for those evenings where you want something homemade, but quick…like a cold spring Friday. Bake at 350 degrees for 35-40 minutes (until internal temperature reaches 160 degrees). Yup…it’s that simple!!! I ate mine with a sweet potato and veggies. The BOY really enjoyed the dish and even ate leftovers! I think this would make a tasty turkey burger as well. 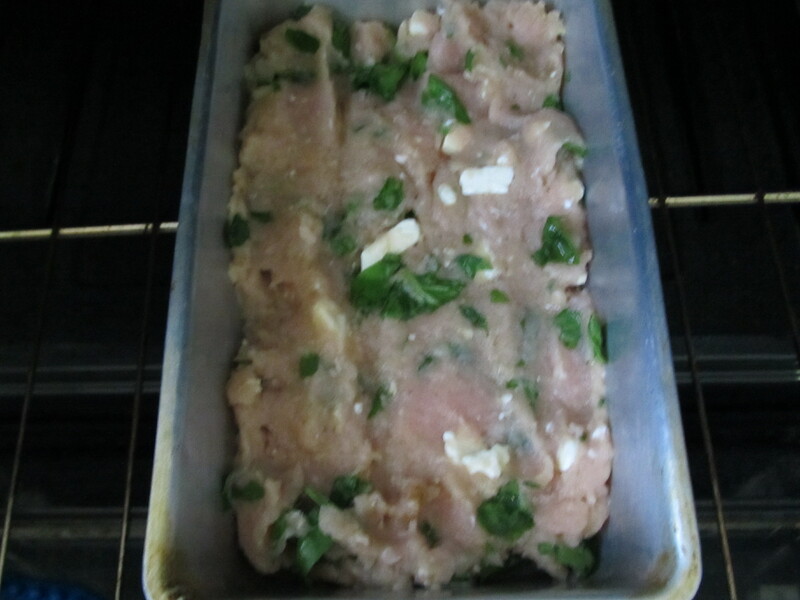 It reminded me of the Spinach and Feta Turkey Burgers that I love during grill season. Have a great 3 day weekend!!! I’m sure you noticed that I have been spending a lot of time on breakfast recently. Now that I have added some variety to my breakfasts, I am moving back to my goal of spicing up lunch. I feel like after my vacation, it took me some time to get back into my healthy eating and exercise groove. 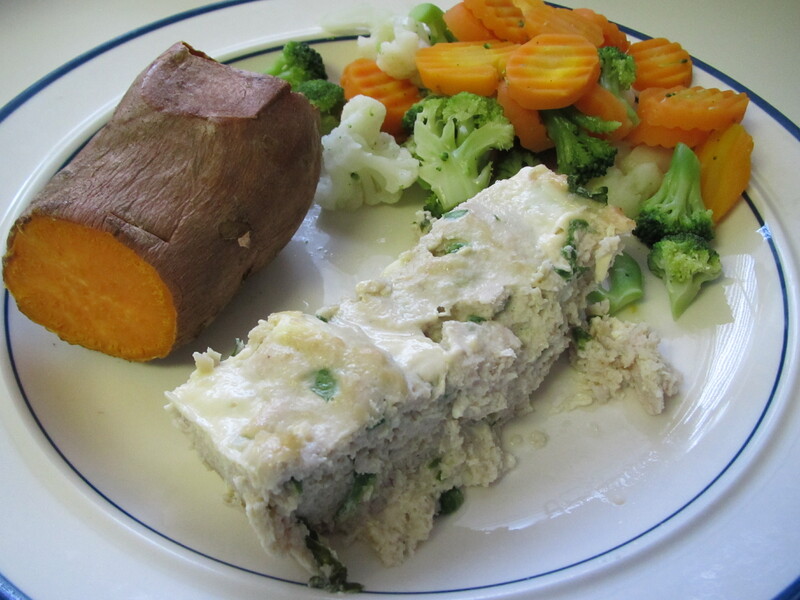 But now that I am in full-on training mode, I am also back in the kitchen preparing my weekly meals. I made a new friend on my way home from Florida a few weeks ago. And no it is not my typical style to pick up friends on airplanes. But as chance has it, we have a lot in common. 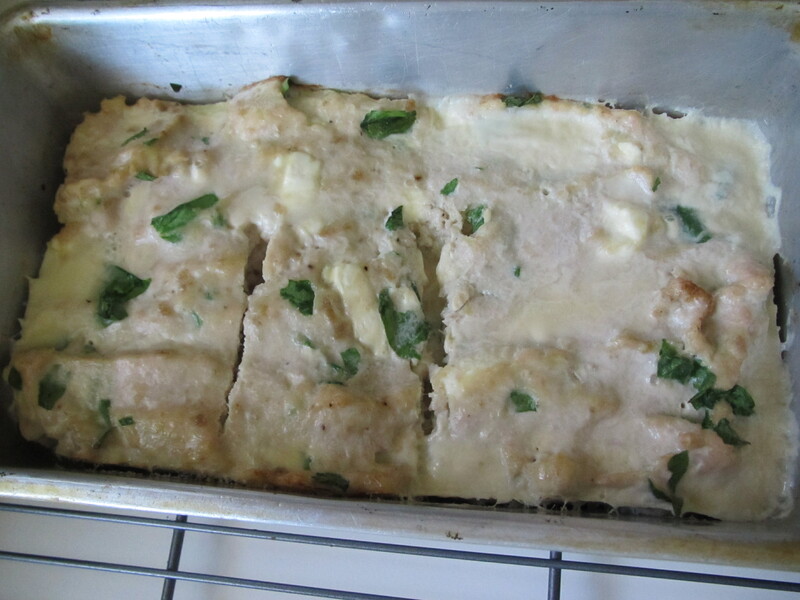 She shared with me this fabulous recipe and so I made it for lunch this week. I made a few minor adjustments in measurements written in next to the original recipe. 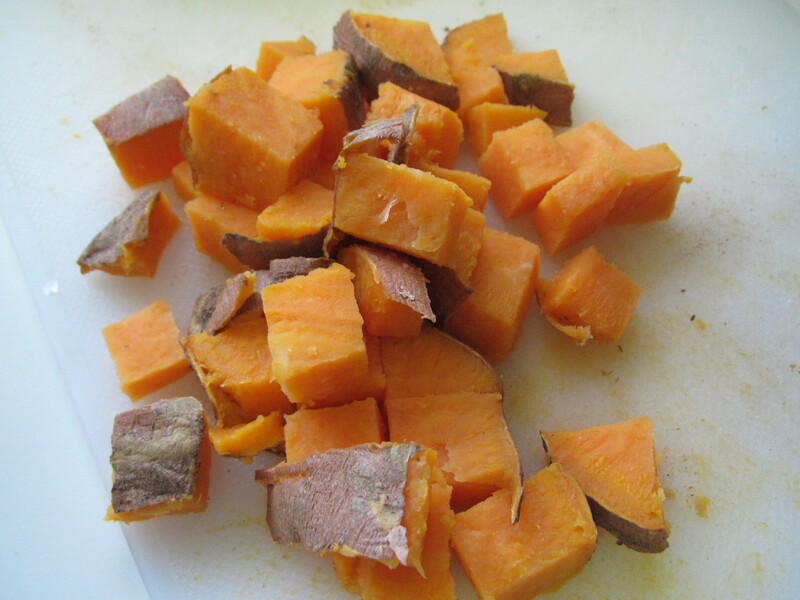 Boil sweet potato in stock or water until fork tender, approximately 20 minutes. 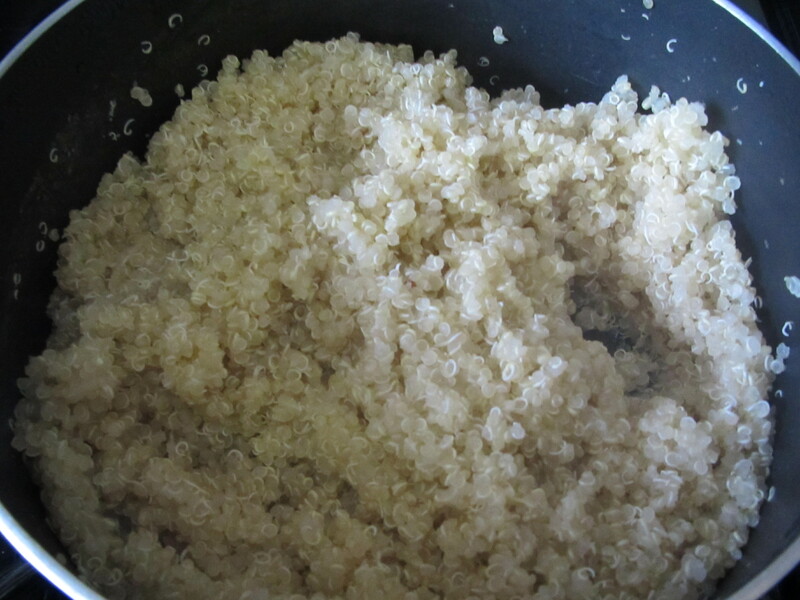 Prepare quinoa according package directions using either water or stock. If using water, add a little salt to the water. Turn off heat, cover, and set aside when completed. Make salad dressing. 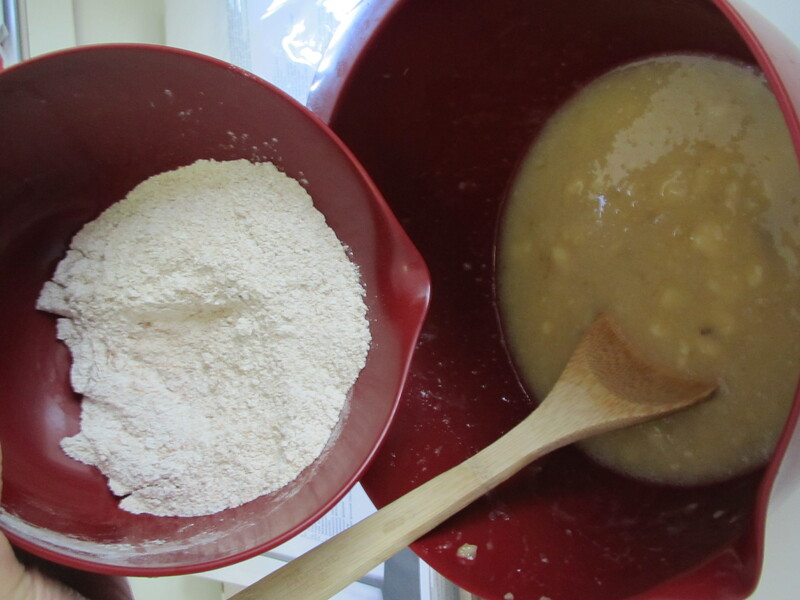 Combine all Dressing ingredients in small bowl and mix with hand-held blender on low at first, then increase to medium, until well blended and thick/creamy in appearance, approximately 1 min. Set aside. Check sweet potato. When done boiling, let cool for a minute, then dice and place potato cubes in the salad dressing. Set aside. Peel tangerine/orange, removing any seeds if necessary, and separate the slices. Cut slices in half to make them bite size. 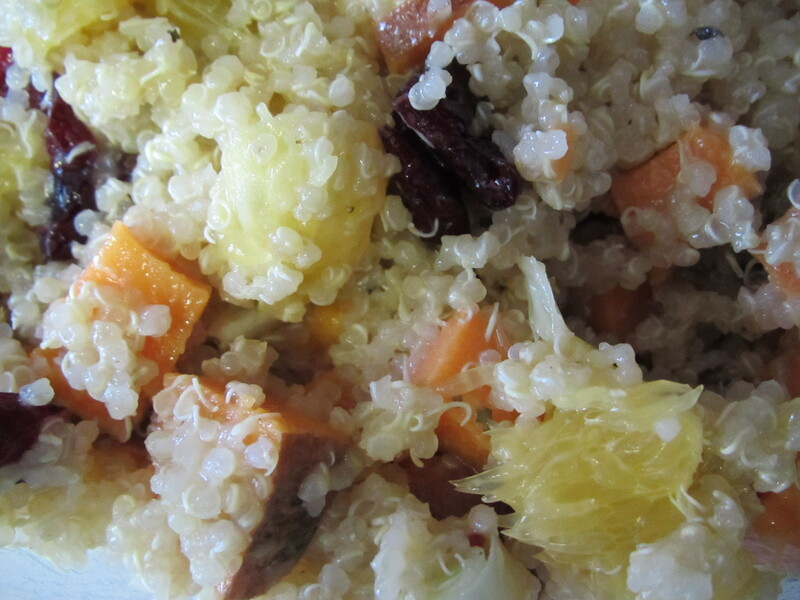 Add all remaining ingredients – tangerine/orange slices, craisins, onion, and almond slices – in the quinoa pot. 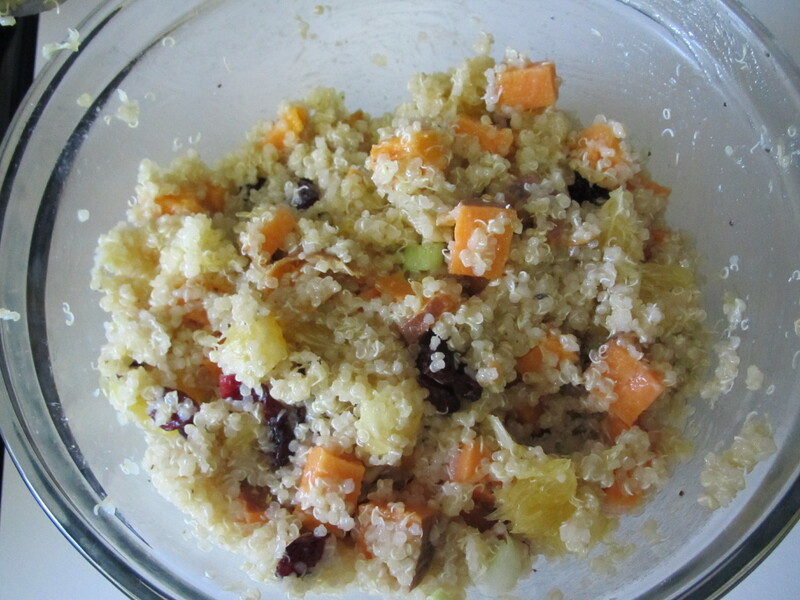 Pour salad dressing and potato mixture into quinoa. 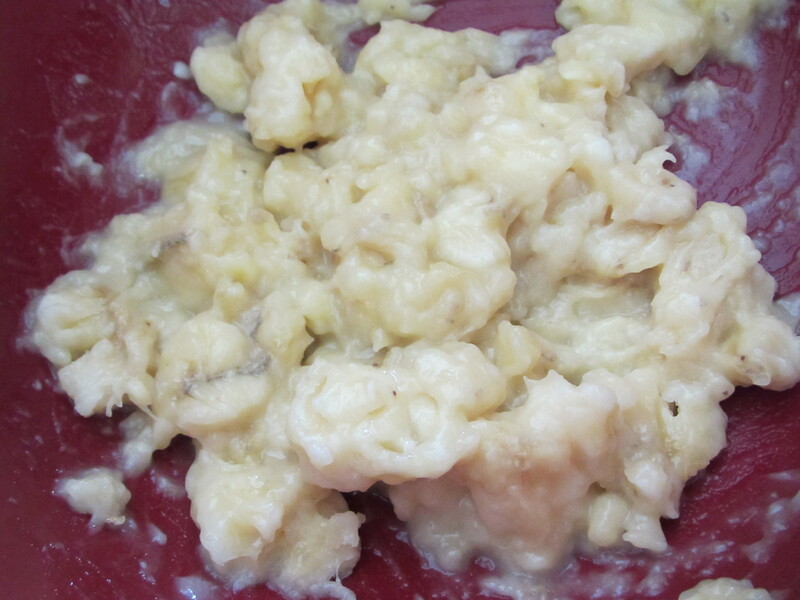 Stir to combine and coat everything with the dressing. 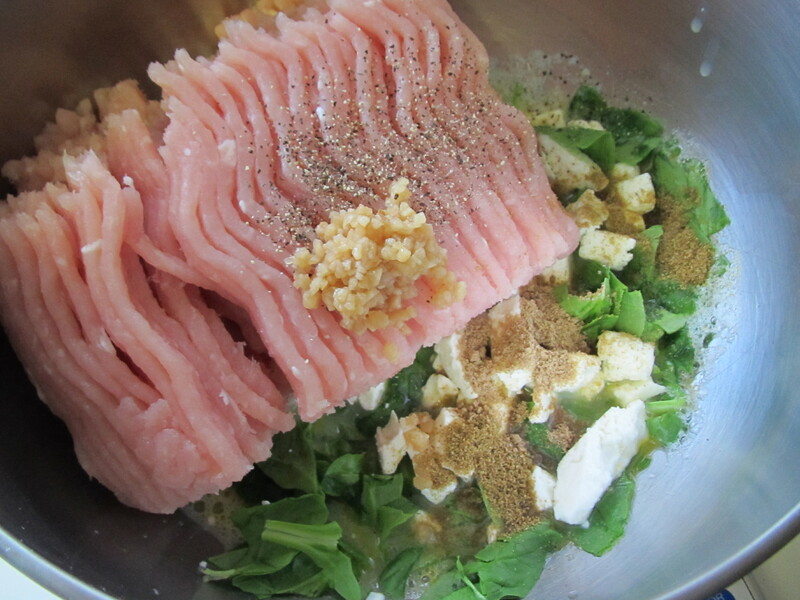 Add salt and fresh ground pepper to taste, if necessary. May be eaten hot or cold, so serve immediately or refrigerate for later! 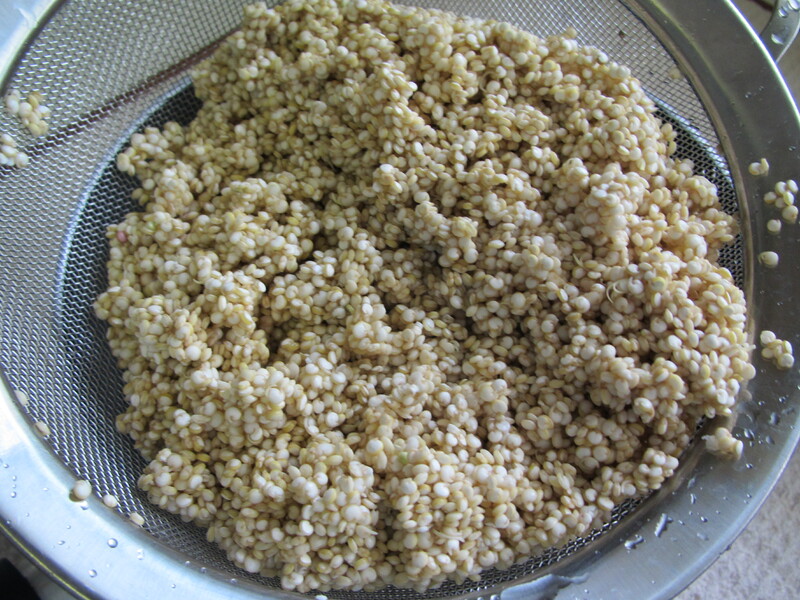 Initially, I rinsed and drained the quinoa that I bought from the bulk bin at Whole Foods. I have heard mixed feedback on whether or not this is a necessary step. So I’m asking you…DO YOU RINSE YOUR QUINOA? 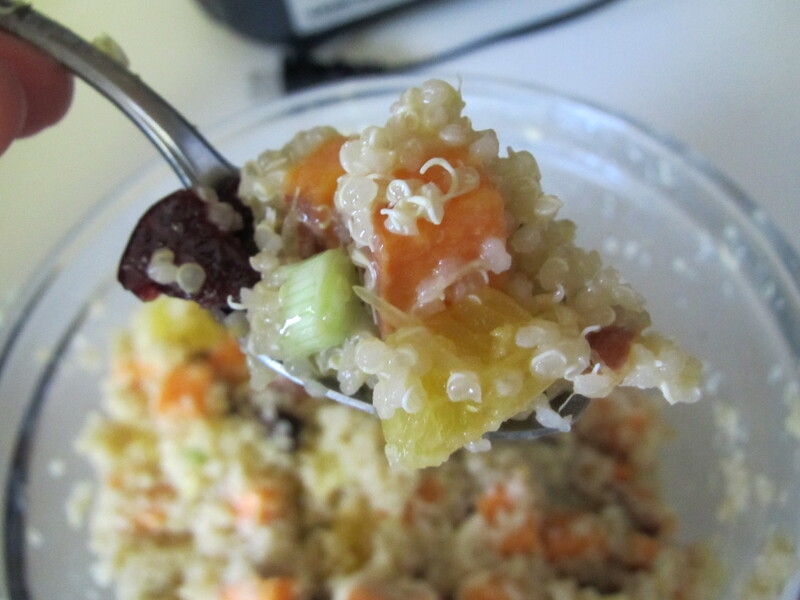 I prepared my quinoa per Terry Walters instructions in her book Clean Food. So check out my new kitchen toy!!! 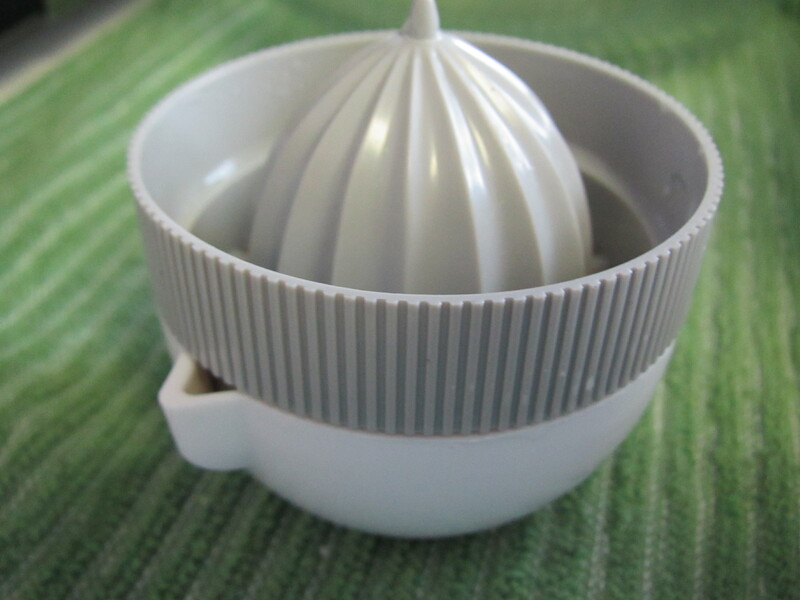 It is a citrus juicer and I love it. 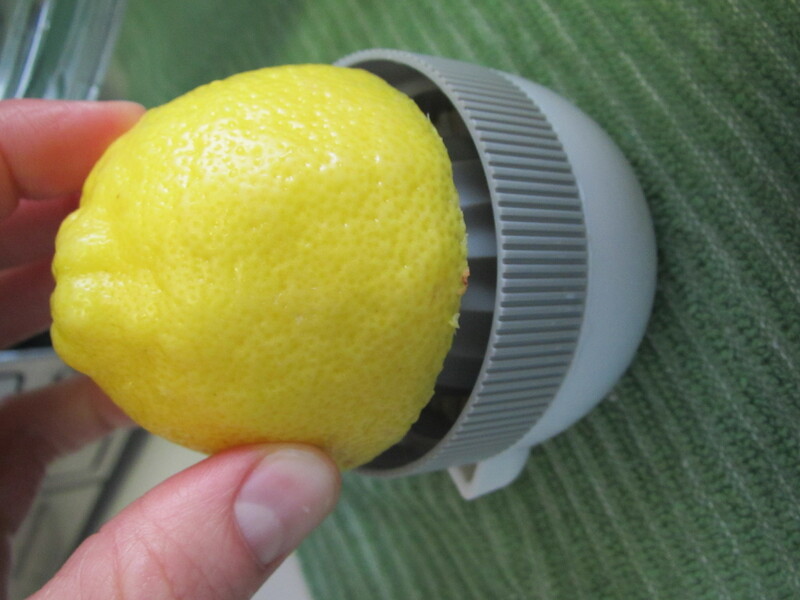 I can get so much more juice out of my lemon and limes and it is easy to wash. 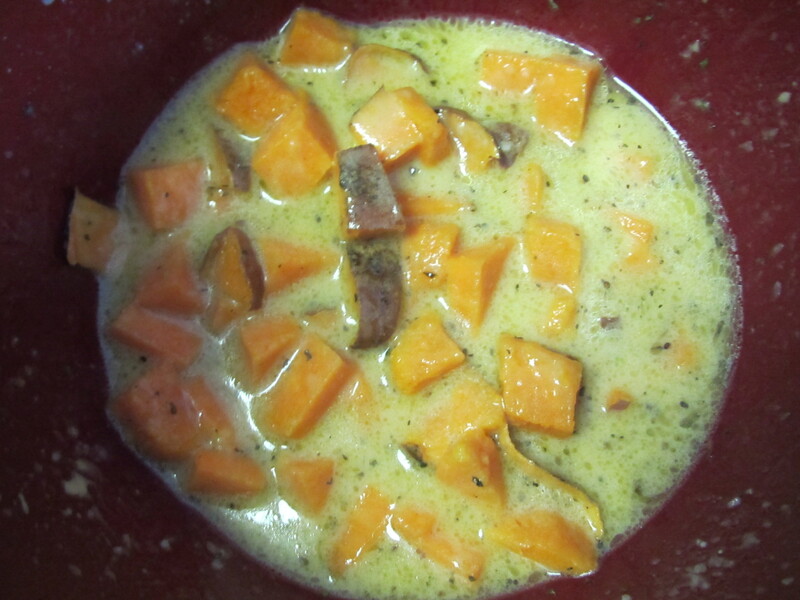 I baked my sweet potato in the oven and then diced and added to the dressing. 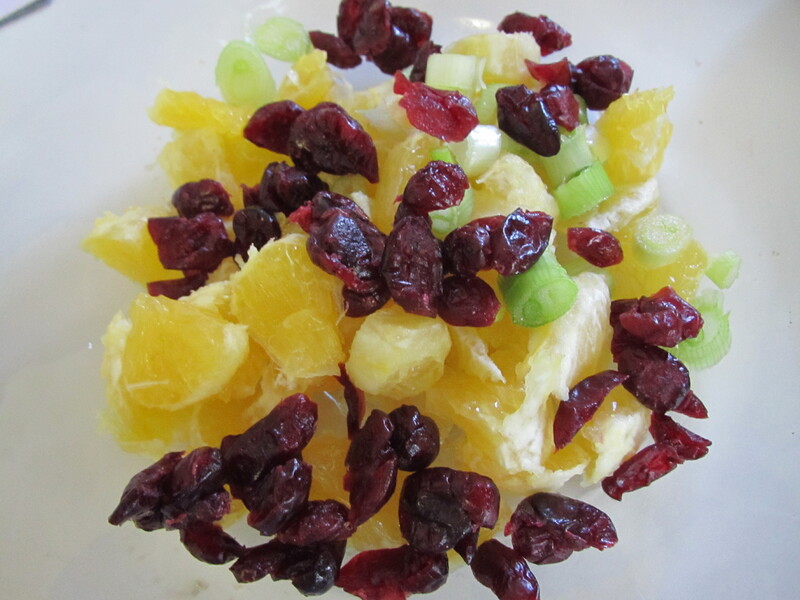 I cut up an orange and combined it with green onions and dried cranberries. I omitted the almonds this time around (I didn’t feel like chopping them). Add the cooked quinoa and dressing with sweet potato. 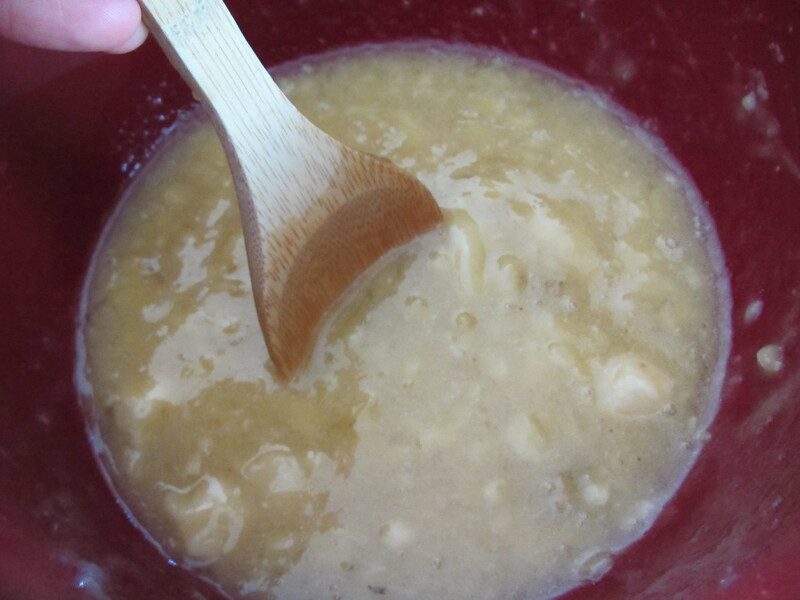 Stir to coat and ENJOY! This salad is AMAZING! It looks and tastes just like something you’d find at the Whole Foods salad bar (only better)! Maybe I should make a habit of picking up new friends at the airport! 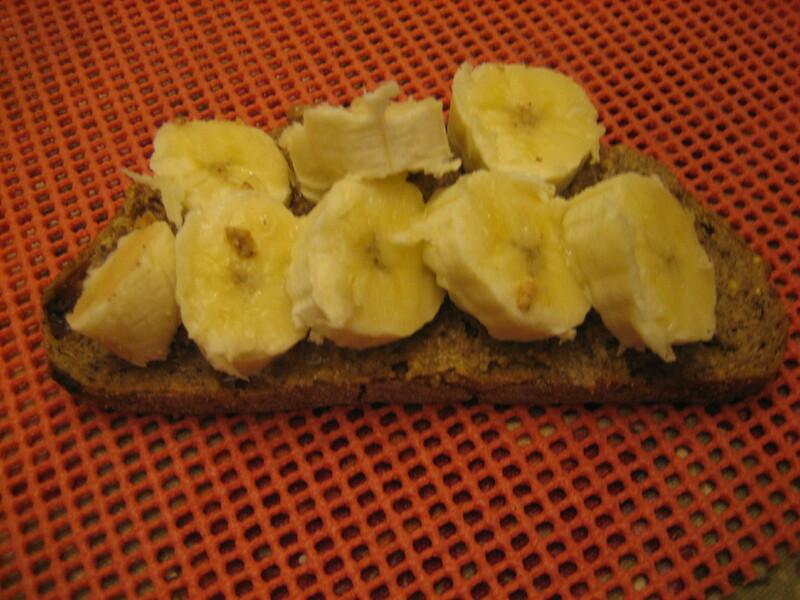 My mom gave me some old bananas this morning with a request for a healthy banana bread. 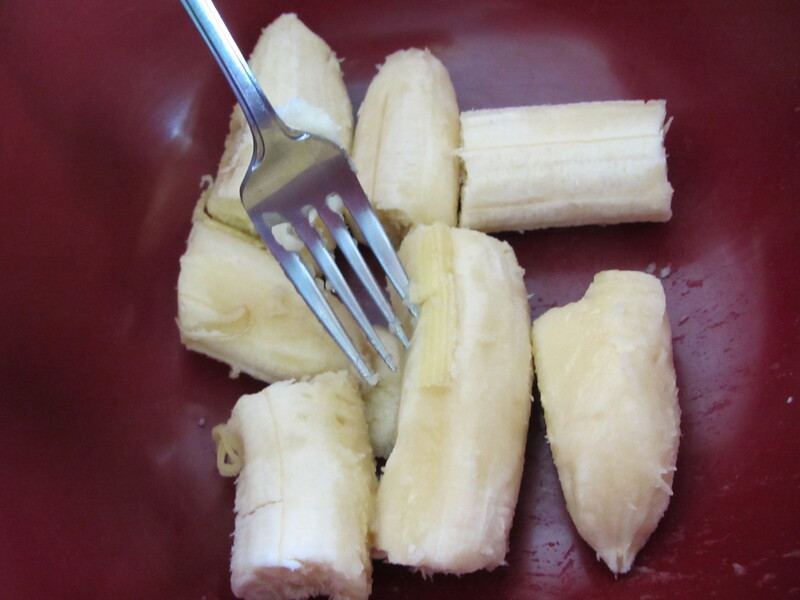 If you are like me (and my mom) then you buy your bananas at Costco. 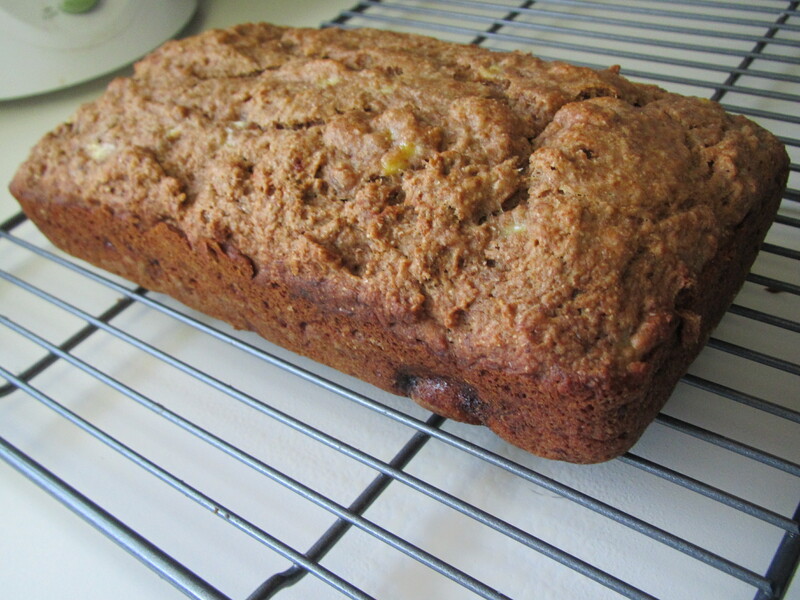 I always have some extra over-ripe ones for freezing or banana bread. 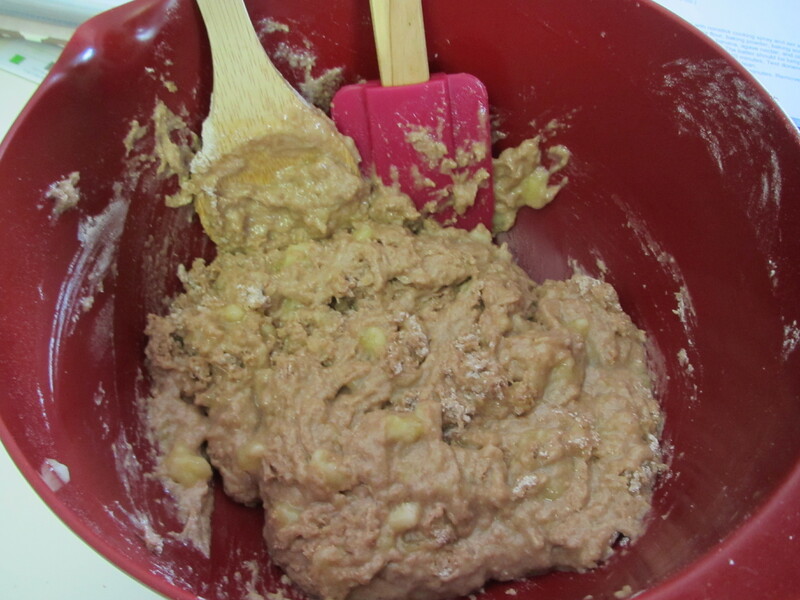 I found this recipe when I was searching for a clean banana bread. 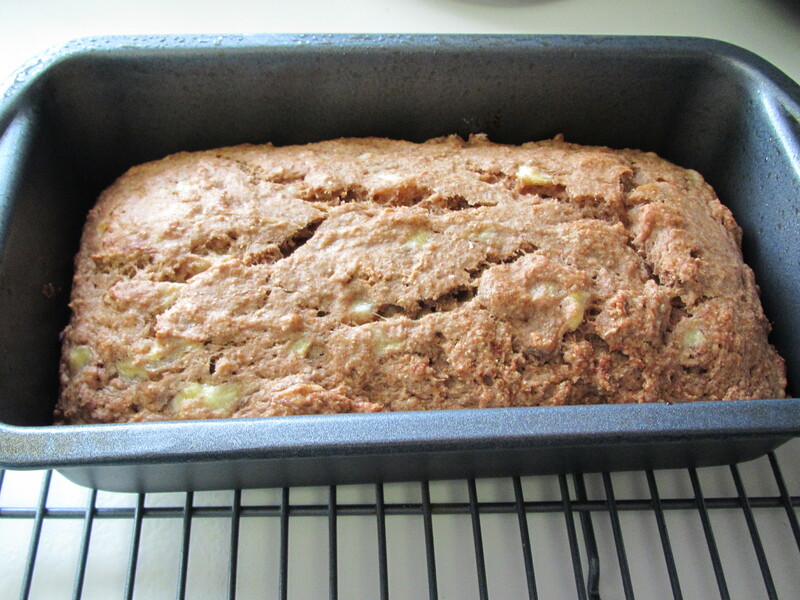 Clean quick breads are hard to find, so I am excited to try this one and I am happy to share it with ya’ll! 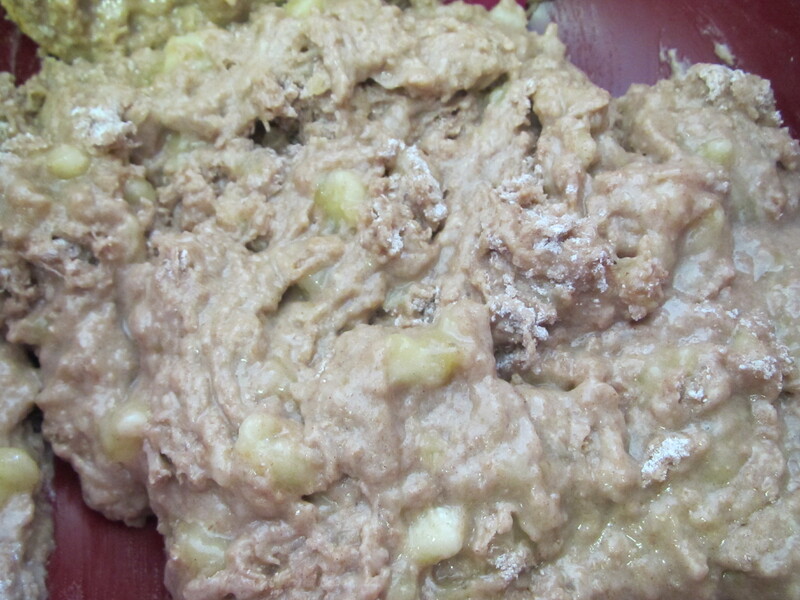 As always, the first step is mashing your bananas. 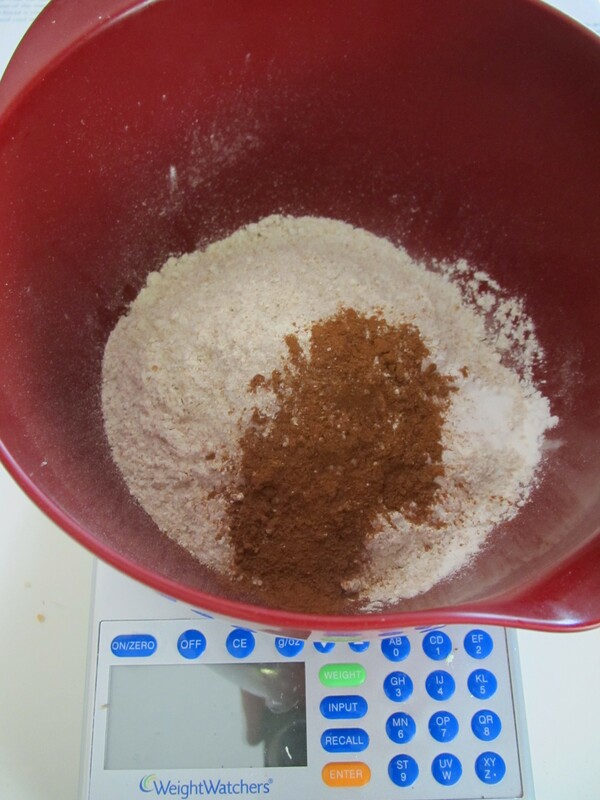 If you aren’t measuring your flour, I highly recommend it. Not only is it more accurate, it is super easy clean up. 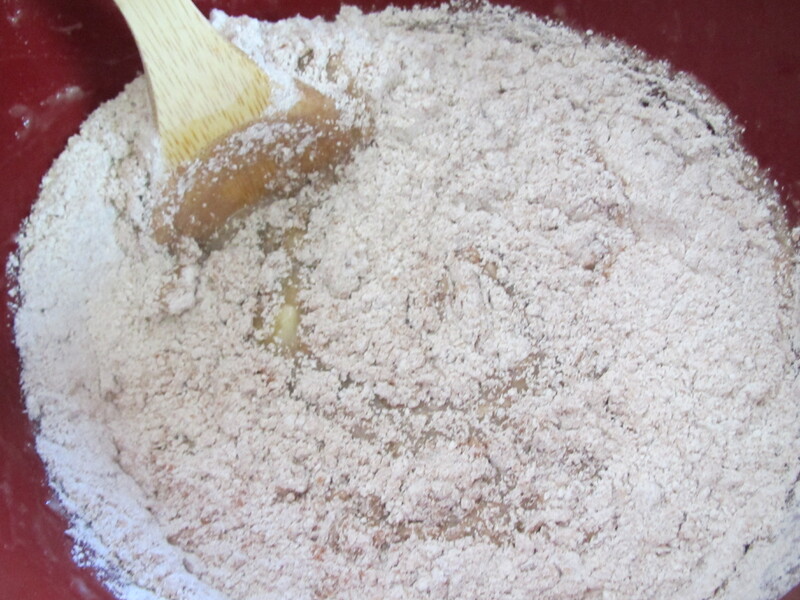 Combine the wet ingredients and then add the dry mixture to the wet. Your dough will be lumpy. 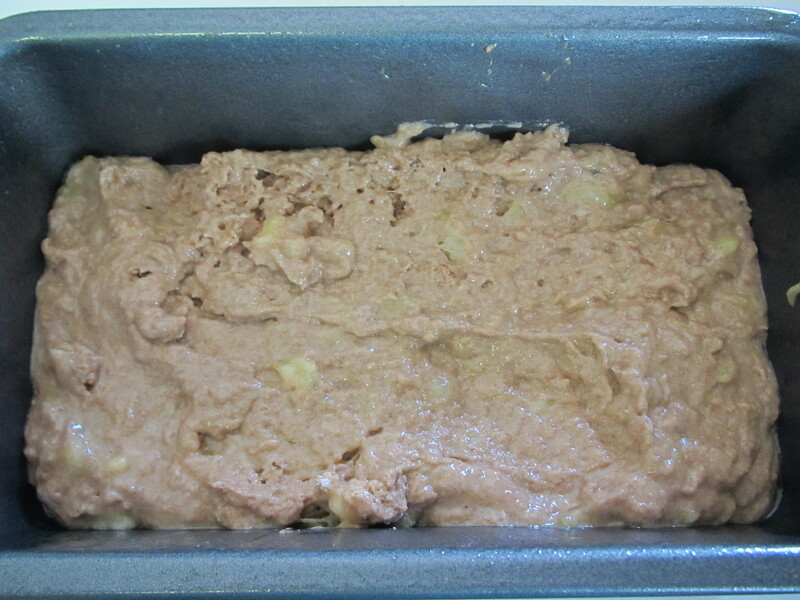 Bake 35 minutes; then cool ~10 minutes before removing from pan. 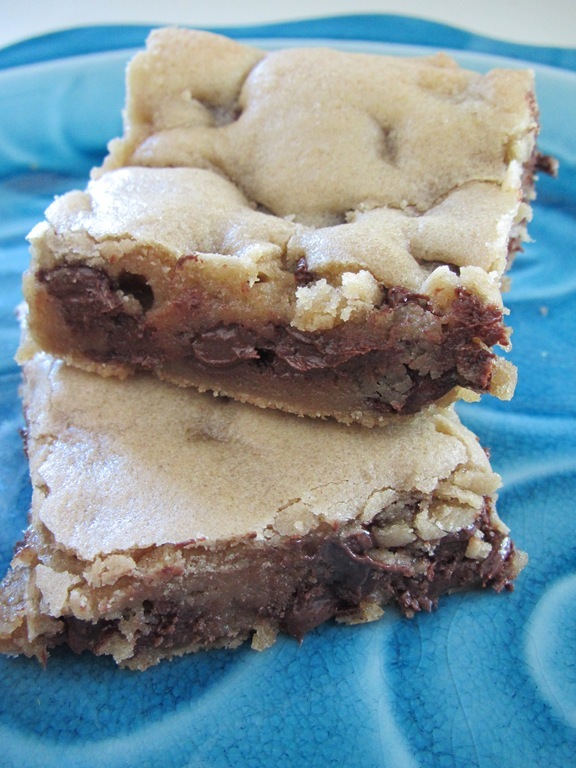 Although I learned a new healthy tip this week…only bake goods that come out in one piece (to avoid mindless taste-testing and extra calories). I broke the rule to enjoy a slice of the bread (sorry mom!). It is a beautiful looking and smelling bread that tastes as good as it smells. I enjoy breads with whole wheat flour and you won’t even miss the sugar! 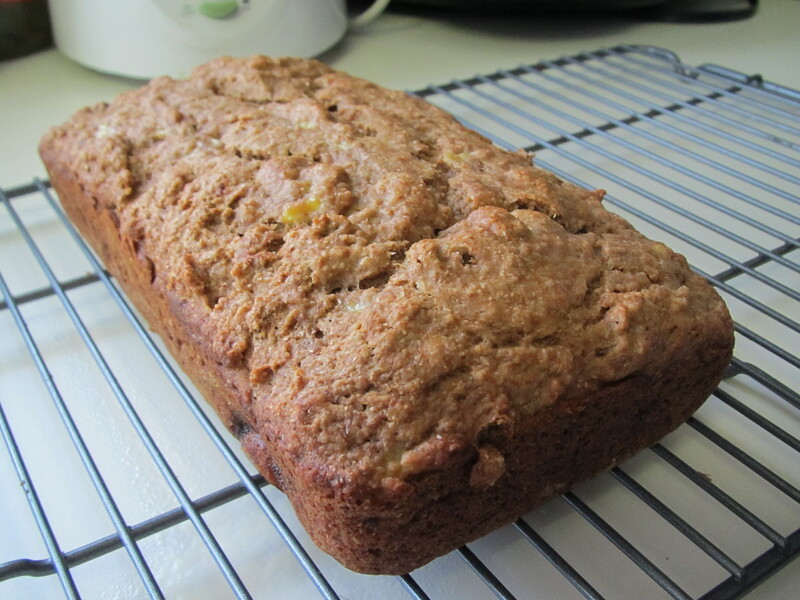 If you are looking for other clean bread recipes, try my (I use that term lightly) Butternut Squash Bread! It’s one of my favorites!